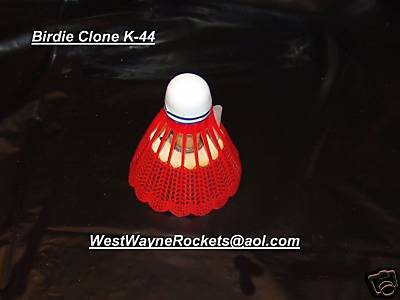 WestWayneRockets Estes Birdie Clone K-44 Kit RED. For all you BARs out there now is your chance to go back 25 years and relive your youth. Estes stopped making these little guys a LONG time ago. For those of you new to rocketry you'll enjoy flying this little bird. WestWayneRockets has recreated this little gem from the past and modernized it with plywood centering ring, engine block, stiff launch lug and plastic shuttlecock. Short assembly time gets you in the air fast. Tumble recover means no wadding or chute to pack. And it flies on 13mm mini motors so it's also cheap to fly. Diameter: Nose 7/8 Base 2 ?